Cinnamon rolls are one of my many weaknesses. They are excellent breakfast sweets just as they are. Lately, however, I’ve started seeing more and more varieties of rolls like sticky lemon rolls, coconut pull apart rolls, and butterscotch sticky buns. 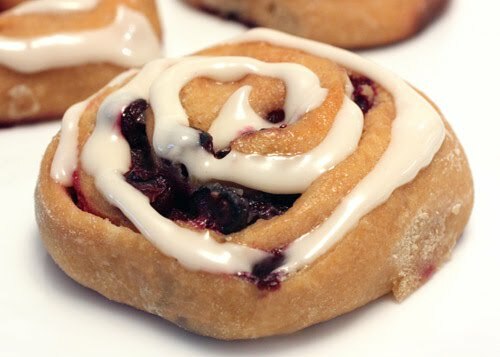 And, did you see Foodblogga’s blueberry sweet rolls last summer? Then, I just saw another version of blueberry cinnamon rolls on Health Nut a couple of weeks ago. 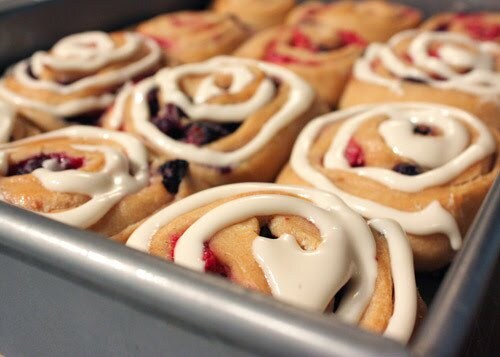 I started getting ideas about changing things up with a slightly more wholesome sweet roll made with sourdough and whole wheat flour, and Texas-grown blueberries are everywhere I look lately. Blueberries on their own would have been great, but I thought using both blueberries and raspberries would give these some Fourth of July spirit. I followed a recipe for sourdough cinnamon rolls using half whole wheat flour and half all-purpose flour. The recipe states the commercial yeast and vital wheat gluten are optional. I added the yeast but not the gluten. The dough also included sourdough starter, water, sugar, powdered milk, melted butter, and eggs. With less butter, no cream cheese, and whole wheat flour, these were virtuous sweet rolls compared to the last ones I made. I let the dough rise for a few hours, and then rolled it into a big rectangle. 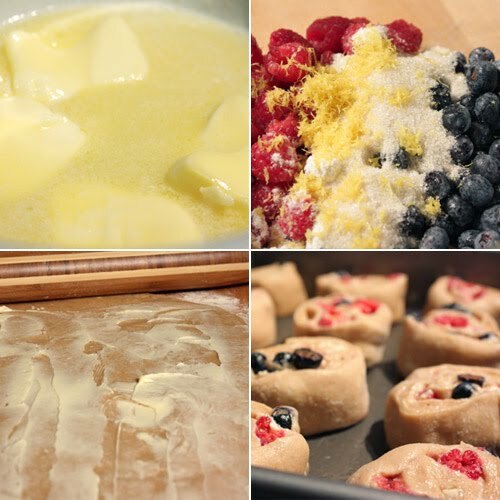 I spread on two tablespoons of softened butter and scattered the berries, one half pint of each, that had been tossed with a little sugar and lemon zest and a tablespoon of flour. The dough was rolled up and cut into smallish pieces. I went with shorter rolls this time in an attempt to limit the calories per roll. They were practically guilt-free. I let them sit in a baking pan, covered with plastic, in the refrigerator overnight, and baked them the next morning. Once baked and cooled, I made a simple glaze with confectioners’ sugar and lemon juice to swirl on top of each. The pretty berries and lemony glaze made these seem more decadent than they were, and the whole wheat flour gave them some nuttiness. Veering off the cinnamon path was a good change of pace. Now that I’ve dabbled with berries in sweet rolls, the lemon, butterscotch, and coconut varieties are in my sights. Nice way to add a healthy spin to something so evil! oooh delish!! i just made chelsea buns recently (http://colehillkitchen.blogspot.com/2010/06/sweet-and-soft-chelsea-buns.html)and these are definitely on my must-bake list now!! They sounds healthy and look pretty delicious Lisa. What a perfect 4th of july treat with the red, white, and blue. HOpe you have an awesome holiday weekend. my favourite berriieessss :D love that roll of berriesss.. yummmmm.... sweeeeeeeetttt!!! and sure they look pretty and sound delicious!! This looks amazing! I like the idea of adding berries! Perfect for a 4th of July brunch! Loved the photos, particularly the stripes of berries and lemon zest.... very beautiful! These look so good! I never would have thought of adding berries, but can't stop thinking about it now! As a San Francisco native who grew up on sourdough, I think these rolls look way more enticing than any plain ol' cinnamon roll. These look way more sophisticated than just a cinnamon roll. The sourdough adds a nice tang along with the sweet fruit. i think i can state with certainty that there would be no version of sweet rolls that i wouldn't like. these look awesome, lisa--great variation! Cinnamon rolls are my favourite. It's great to see a healthy version of these rolls. Now I can eat more without feeling quilty. Hehehe! I like this summer influenced cinnamon roll, especially the lemon glaze. This looks great! Oh my goodness.. These rolls look fantastic with the frosting! Yum! These sourdough rolls look terrific! The lemon glaze atop is just too good to miss! Hmmm. I think it would be unpatriotic of me NOT to make these. Don't you agree? They look seriously fantastic. I think everything tastes better with a fruity infusion, but these look especially good! How incredibly tasty these sound and like you I have a serious weakness for sweetrolls. I grew up with the homemade version from my mom and have been on the quest to find the perfect replacement ever since She is 2000 miles away. These beauties might do the trick. What a delicious spin on a cinnamon roll! These are a nice, refreshing change from the classic. Those butterscotch ones sure sound good too! I'm loving your healthier cinnamon roll version. They look delicious! I am in desperate need of a dozen of these!